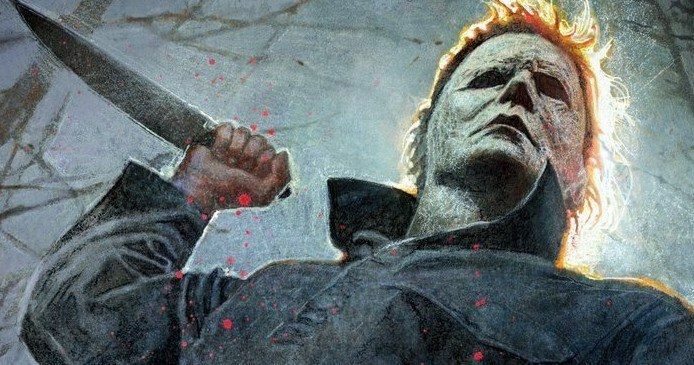 A killer new Halloween 2018 poster has been revealed. The poster made its way online just ahead of San Diego Comic-Con, which kicks off tonight with preview night and runs through Sunday. Universal and Blumhouse are bringing the new Halloween to the convention and, to kick things off, they have shared a brand new, SDCC exclusive poster which is cool enough to get horror fanatics even more excited for what's coming our way later this year. The poster comes from artist Bill Sienkiewicz and, as good as the official theatrical poster is, this thing may put that one to shame. This Halloween poster is all Michael Myers. The vantage point has us looking up at the towering slasher, with a knife cocked back in his right hand getting ready to do what he does best, and what he does isn't pretty. He's surrounded by trees and there are spots of blood splattered all over. Even the lettering for the movie's title looks fantastic. The Twitter account for the movie had this to say about the poster. "It's here! The exclusive San Diego Comic Con #HalloweenMovie poster by artist Bill @sienkiewiczart. Want to get one? Turn on notifications for @halloweenmovie for updates from #SDCC this weekend." So, it sounds like those who won't be at the convention this weekend may have a chance to get their hands on this poster. Bill Sienkiewicz took to Twitter to reveal how those who will be at SDCC can get one saying, "Excited to unveil this #HalloweenMovie poster for SDCC! Get a free mini-poster when you scan your badge at #SDCC Booth #2614, starting with preview night at 6PM PT!" He didn't make any mention of how limited the quantities of this poster are, but if you really want, best not risk it. Get there quickly. Universal and Blumhouse have a panel this weekend dedicated to Halloween and the Unbreakable sequel Glass. That means Michael Myers and Laurie Strode, once again played by Jamie Lee Curtis, are going to get a lot of attention in the coming days. It's expected that we'll be getting a new trailer for the movie during the panel. It's likely that the trailer will be released online after it has screened in Hall H, but that hasn't been confirmed just yet. The movie's first teaser trailer was released online early last month and was given a very warm welcome from fans. The new Halloween is directed by David Gordon Green and serves as a direct sequel to the original. The script was co-written by Green and Danny McBride. John Carpenter, who directed the original horror classic, is on board as an executive producer and will provide the score for the movie's soundtrack. Halloween is set to arrive in theaters on October 19. You can check out the brand new poster, courtesy of the official Halloween Movie Twitter account, for yourself below.